Submitted by mark on Sunday, April 22nd, 2018 at 3:42 pm. The Blue Heritage Plaques project is a new initiative from Historic Places Mid Canterbury to identify and promote our local built heritage, through the use of a distinctive and bold blue cast aluminium plaque fixed to the facades of our more significant historic buildings. 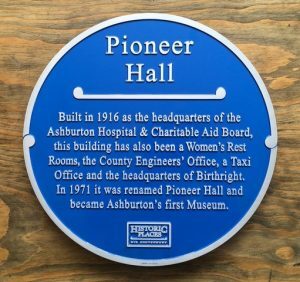 As well as giving a short history of the building, informing locals and visitors about its particular historical significance, the Blue Plaques aim to increase the prominence of our historic buildings, encouraging increased awareness of our local history and supporting the retention of our existing heritage assets. They also assist in reinforcing the importance and value of these buildings to the local community and help foster a desire to protect and maintain our unique local history and identity. The success of the project within the Ashburton District has encouraged the group to start promoting the scheme further afield, through local HPA member organisations, with aspirations of eventually taking the programme nationwide, creating an instantly recognisable symbol which proudly identifies our nation’s valued built heritage. Submitted by mark on Wednesday, April 18th, 2018 at 4:53 pm. 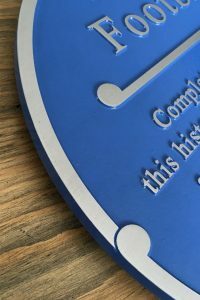 Are you interested in a Blue Heritage Plaque? Historic Places Canterbury is the local contact if you are interested in a Blue Heritage Plaque. Submitted by mark on Wednesday, September 19th, 2018 at 1:27 pm. Are you interested in a New Zealand Heritage Plaque? The Historic Places Aotearoa Member Organisations are keen to help you with the text, co-ordinate the production etc. The New Zealand Heritage Plaques project is a new initiative from Historic Places Mid Canterbury to identify and promote our local built heritage, through the use of a distinctive and bold blue cast aluminium plaque fixed to the facades of our more significant historic buildings. As well as giving a short history of the building, informing locals and visitors about its particular historical significance, the New Zealand Heritage Plaques aim to increase the prominence of our historic buildings, encouraging increased awareness of our local history and supporting the retention of our existing heritage assets. They also assist in reinforcing the importance and value of these buildings to the local community and help foster a desire to protect and maintain our unique local history and identity. The success of the project within the Ashburton District has encouraged the group to start promoting the scheme further afield, through Historic Places Aotearoa and its Member Organisations, and eventually take the programme nationwide, creating an instantly recognisable symbol which proudly identifies our nation’s valued built heritage.